AustinPostcard - Texas State Capitol, Austin, Texas. 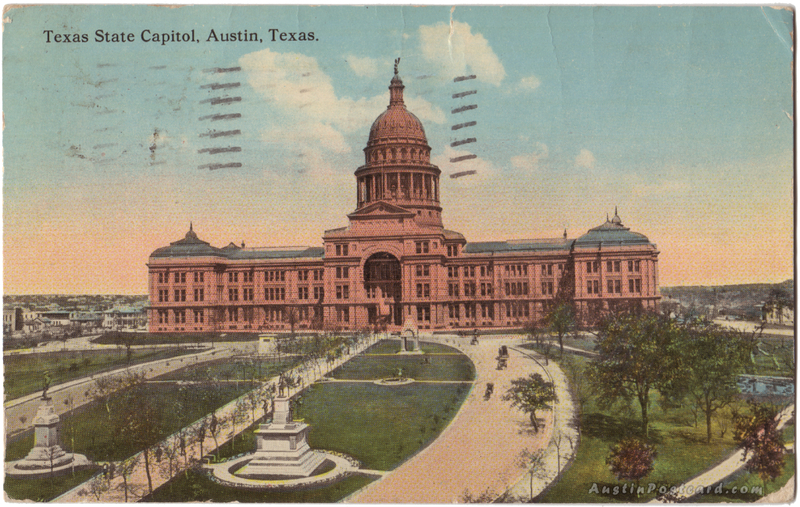 Postcards > State Capitol & Capitol Grounds > Texas State Capitol, Austin, Texas. Texas State Capitol, Austin, Texas. Text on Back: THE TEXAS STATE CAPITOL, AUSTIN, TEXAS, is the largest public building in the U.S. except the Capitol at Washington, and is the seventh largest in the world. Construction begun 1882, cornerstone laid March 2nd, 1885. Was dedicated May 16th, 1888. Built entirely of red granite from quarries at Marble Falls, Burnet Co. Dimensions, north to south, 188 feeet, 10 inches, east to west 566 ft. 6 inches. Extreme height from grade level to top of dome, 311 feet. Building has 258 rooms, 900 windows, 500 doors; covers 6 acres; inclusive of grounds 21 acres. Conservatively estimated the building cost the State $6,000,000.